Locals from Kresna town at a petition stand examining alternative routes for the Struma motorway. Bulgaria’s government has proven yet again its determination to disregard inconvenient truths and opinions at a public hearing on the Environmental Impact Assessment (EIA) and Appropriate Assessment (AA) of the Struma Motorway, connecting Sofia and Thessaloniki, that was held on Monday, September 11, in the town of Kresna. With two thirds of the motorway built, the bottleneck is the road’s middle section that threatens the Kresna Gorge, Bulgaria’s richest biodiversity site. But while five alternatives are on the table, the government has already decided that it should be the one that breaches EU law. €756 million of EU taxpayers money were allocated for the construction of the Struma motorway, of which €274 million has already been spent for the other sections. Bulgaria’s environmental minister was quoted that Bulgaria is expecting to get €680 million from the EU for the finalisation of the project. In view of this the European Commission and the Bulgarian Government must ensure that the project is completed by 2023 in full compliance with EU nature laws. Otherwise the Bulgarian Government risks having to repay some or all of the grants. 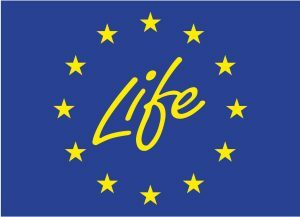 At stake is a biodiversity hotspot of European importance containing 35 especially protected EU habitats for 92 EU-protected species, such as land tortoises, Leopard and Fourlined snakes, 12 species of bat, golden eagles, griffon vultures, bears, wolves, otters and other species. The EIA and AA present five alternative routes of the highway. The main choice is between a full eastern alternative (G20), which by-passes the gorge completely, and a semi-eastern alternative (G10.50), which routes the south-bound traffic on the existing road through the gorge, but by-passing Kresna town, and the north-bound traffic over the hills east of the gorge. Map of the Kresna gorge showing the alternative favoured by locals and environmental campaigners. Environmental groups and nearly 1000 locals have supported a petition in favour of the full eastern alternative outside the gorge, which leaves the existing road for the needs of local communities. 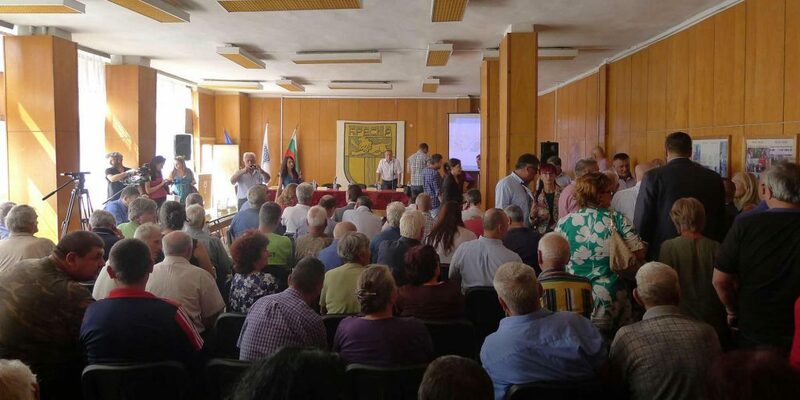 People stressed at the public hearing that the existing local road through the gorge ensures a more direct and cheaper (toll-free) connection to their agricultural lands, to nearby mountain villages and to the main employment, business and educational centers, Blagoevgrad and Sofia, to the north. A semi-eastern alternative is designed to primarily serve the needs of tourists traveling at higher speed to the Greek seaside. It will force the locals to use a much longer, high-speed road at higher altitudes. As consultations often go, not all alternatives are equal. 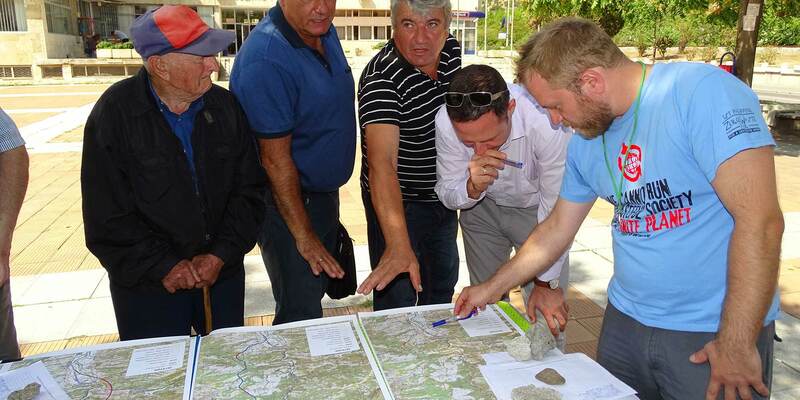 Inside the overcrowded meeting hall project promoters, the Kresna mayor and the Blagoevgrad regional governor advertised the semi-eastern alternative and the promises for commercial zones on the motorway. They all emphasised that it is virtually the only option and that there is no real choice or room for discussion. Their argument was the urgent need to find a solution and to prevent the bottleneck, which has caused a significant increase of casualties in both the gorge and the town of Kresna. The overcrowded meeting hall where the Kresna gorge was discussed. The superiority of human life and safety and the imperative to prevent further road accidents were used very effectively by the event organisers to hijack the purpose of discussing the EIA/AA. Biodiversity protection was juxtaposed as an inferior cause of fanatical ecologists, not as a requirement of EU law and a condition for receiving EU funds for the project. But the Bulgarian government and the Roads Infrastructure Agency, have actively promoted the semi-eastern alternative even before the public meetings. In fact already in April this year the Agency announced that it had selected an extended conceptual design for the motorway on the semi-eastern option, well before the EIA and AA were finalised. Accordingly, the EIA/AA presented at the public hearings had their scope and analysis carefully crafted to favour this option. But there are several serious problems with the semi-eastern alternative. First of all a recommendation by the Bern Convention from 2004 requires from the Bulgarian government to find a route outside of the gorge. Based on this recommendation and after Bulgaria’s accession to the EU in 2007, an Appropriate Assessment from 2008 ruled that, to mitigate the impacts of the motorway on the Kresna Gorge, (i) transit motorway traffic must be routed outside of the Gorge, and (ii) the Kresna section must be completed before other sections, in order to avoid an increase in traffic on the existing road and avoid serious adverse impacts on the integrity of the Kresna Gorge. The second condition has already been breached. Now the government seems to believe it can get away with breaching the first condition, too. The second major shortcoming is the scope of the assessments. 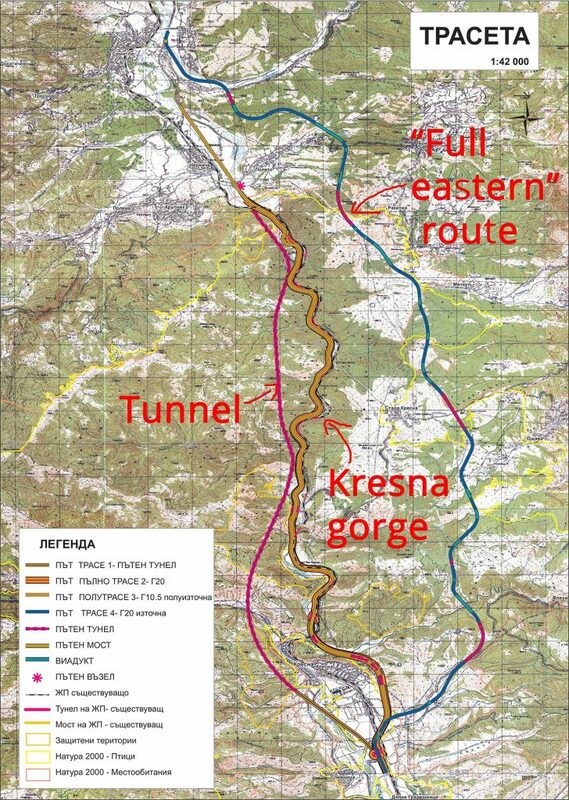 According to public statements of Bulgaria’s minister for regional development, Mr. Nikolay Nankov, the semi-eastern alternative will require ‘widening, rehabilitation and straightening of the turns’ of the existing road through the gorge, as it will take the traffic from Sofia to Greece. The impact of these works are not assessed in the EIA or the AA. Moreover at the public hearing in Kresna project promoters advertised to local people the additional commercial, parking and recreational zones along the motorway – to be situated in the most fertile agricultural land of Kresna. The impacts of these areas, and of the accompanying power and water infrastructure, have not been included in the EIA/AA scope and have not been assessed either. The Bulgarian government has indicated that it plans to finance the ‘rehabilitation’ of the existing road through the gorge from the national budget. This will have adverse impact and will cause irreversible harm to the gorge. The hope, apparently, is that with EU-funding only channeled to half of the motorway, the other half, and the promised commercial zones, can be built in breach of EU Directives, and possibly without an EIA. In short, EU money – EU rules; Bulgarian money – Bulgarian rules. This calculation of the Bulgarian government is extremely bold and dishonest. It can only pass, if the European Commission exhibits the same level disregard for EU law.